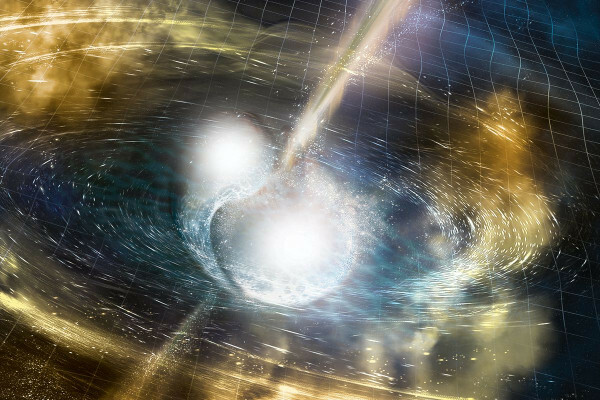 The recent discovery of two neutron stars colliding brings us one step closer to understanding how heavier elements, such as gold and platinum, are formed in our Universe. Throughout human history, gold has played an important role. It is often seen as a sign of wealth and power. Thanks to its ability to conduct electricity easily, it also assumes an important role in areas of electronics and aerospace engineering. But scientists have long been unsure exactly how gold, and other elements heavier than iron, are created. They do not originate in the bowels of the Earth but from somewhere else. So scientists turned their eyes to the skies for the answer. The Universe is a dusty place. Cosmic dust and gas gather together due to gravity and, under the right conditions, start to form stars. How a star will live depends on how much mass it has gathered from its birth cloud of dust. A lower-mass star, like our Sun, lives a long, boring life slowly converting hydrogen and helium into heavier elements through nuclear fusion. At some point it experiences a ‘cosmic hiccup’ and ejects roughly half its mass in the form of carbon, nitrogen and oxygen atoms. These are burped into interstellar space, creating a planetary nebula. What remains is the core of a dead star, known as a white dwarf, which starts cooling down and after a very long time becomes a cold black dwarf. What remains after a supernovae explosion is either a neutron star or a black hole. A neutron star is an extremely dense and small star, composed mostly of neutrons which are packed tightly within a relatively small volume. One teaspoon of a neutron star weighs around 5 billion tonnes! A black hole is even more extreme with its large mass being confined to an even smaller volume from which not even light can escape. At the beginning of the 20th century, Albert Einstein forged the theory of general relativity. This theory tells us that two massive objects spiralling in toward each other generate ripples in space-time that propagate at the speed of light. These are the so-called gravitational waves. This prediction has now been proved correct by the first ever direct detection of gravitational waves by the LIGO and Virgo Scientific Collaboration instruments in September 2015. The detected signal revealed to scientists that these waves originated from the ‘in-spiral’ phase of two black holes that ended in a collision leaving behind an even bigger black hole. This detection has shaken the scientific community, by providing further proof in favour of general relativity. In just a cosmic blink of an eye, on August 17th 2017, another detection of gravitational waves was made. But this time, only 1.7 seconds after the detection of the gravitational ‘thunder’, a short flash of gamma-ray ‘lightning’ was also detected. Scientists immediately knew that this time they had detected something different, something that had never been directly detected before. It was the collision of two neutron stars, giving rise to a powerful kilonova explosion. Theory tells us that these kinds of explosions should produce not only gravitational waves but also light of all the different colours of the electromagnetic spectrum. Knowing what to look for, scientists all over the world turned more than 70 telescopes toward the sky, searching for the expected light show. And amazingly, they found it! Astronomers spent more than two weeks collecting light coming from the kilonova. This light provided valuable information about the astrophysical processes that were happening at the time of the explosion. By performing a state-of-the-art ‘forensic’ job, they discovered that the pair of neutron stars, prior to collision, had lived a long life together bound by gravity. They orbited their host galaxy, NGC 4993, until roughly 130 million years ago when they ended their lives in the magnificent collision that produced the gravitational waves. The electromagnetic showdown that followed the detected collision of two neutron stars was caused by the radioactive decay of the new elements that were produced in the debris after the collision – including new elements such as gold. The light signatures revealed that this cataclysmic event produced quantities of gold and platinum equivalent to ten times the mass of the Earth! And in fact, the models suggest that the combined mass of all the heavy elements produced in the explosion was equivalent in mass terms to 16,000 planet Earths! The reason why elements such as gold and platinum are called ‘heavy’ lies in the fact that there are large numbers of protons and neutrons within their nuclei. In order to create these kinds of elements, large supplies of neutrons are needed, and when two neutron stars collide, they spew a large quantity of their material, mostly neutrons, into space. 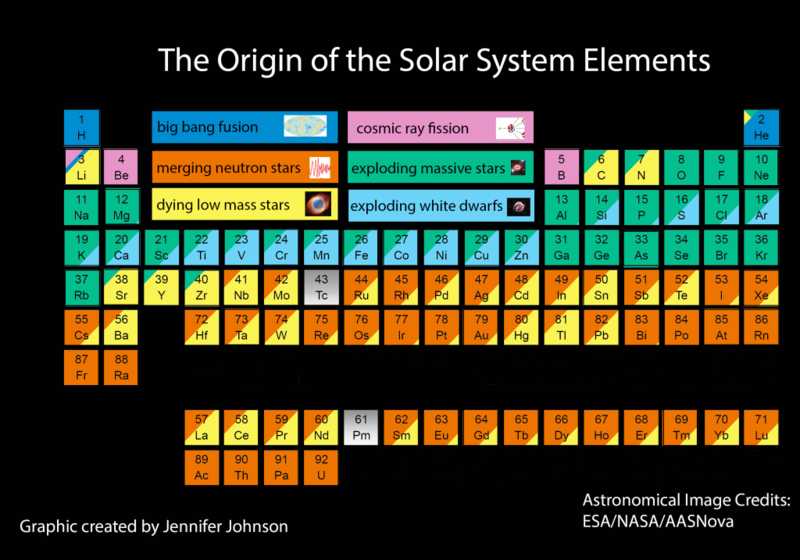 This is exactly why collisions of neutron stars are the perfect setting for the birth of heavy elements. 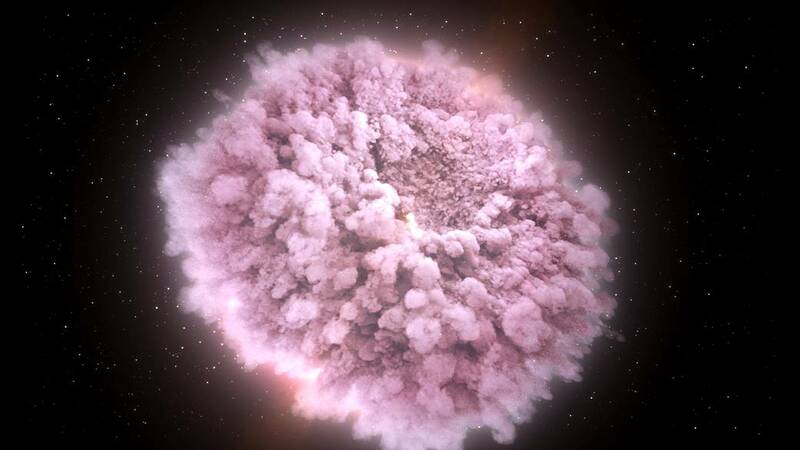 This is how we now know that it was a kilonova explosion that, billions of years ago, spewed gold and other metals into the clouds of dust and gas which eventually formed our Solar System. The explosion left behind its precious signatures as a gift for us to use, but also to serve as a reminder of the two neutron stars that gave their lives to make our life rich with metals. Metals that, in turn, helped us to study the Universe and answer questions like: where did all the gold come from? Where did gravitational waves come from? But didn't BICEP detect them before? am confuused about the article, can i get a brief summary on the story? Everyone's entitled to a personal opinion. You don't need our permission!